The Raritan Central Railway serves the Raritan Center Business Park - a 2,300-acre logistics center featuring millions of square feet of space. The park is located within the heart of the greater New York metropolitan market and in close proximity to the Port of New York & New Jersey. 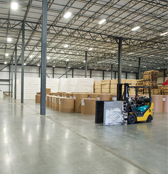 With numerous transload, cross-dock, warehousing and “3PL” service providers located in the park, Raritan Center offers an array of services to businesses shipping a wide variety of products into the largest consuming market in the U.S. The park is also an ideal location for businesses interested in establishing their own light manufacturing or distribution operations in the region. Because of it’s prime location and the amenities it provides, Raritan Center is home to regional distribution facilities for world class organizations including FedEx, The Home Depot, Certainteed, Arizona Beverages, and many more. Raritan Central Railway crews can provide multiple daily switches to all customers allowing very efficient utilization of rail cars and enabling customers to limit (if not completely avoid) demurrage costs. Direct interchange with both the Norfolk Southern Railway and CSX Transportation, six days per week. Transloading, cross-dock, warehousing and 3PL partners offer specialized services for shippers and receivers of a wide variety of products including paper, plastics, packaged and fresh foods, canned goods, beverages, building products, non-hazardous bulk products (dry and liquid), over-dimension shipments and more. 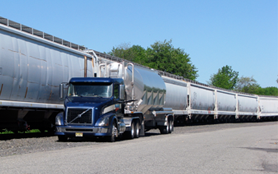 At team of professionals to assist with the coordination of rail deliveries, transloading, warehousing, and trucking. 23 miles of track maintained to FRA Class 2 standards and capable of handling loaded rail cars with a gross weight of up to 286,000lbs and “Plate-F” dimensions. Routes to and from the Raritan Central Railway via both the Norfolk Southern Railway and CSX Transportation are also cleared for shipments with a gross weight of up to 286,000lbs and “Plate-F” dimensions. Multiple, modern “food-grade” and “paper grade” buildings (approximately 15 million square feet of distribution and office space). Nearly a half-million square feet of space dedicated to plastics packaging. Approximately 150 car spots for bulk plastics transloading. Approximately 150 car spots for storage-in-transit. Availability of dedicated bulk transload spots for “food-grade” products. Access to a private barge terminal enabling transloading of products (steel, piling, etc) between rail cars and barges for delivery to points within New York Harbor and adjacent waterways. Warehouse / cross-dock space controlled by the Raritan Central Railway available for lease or use. The Raritan Central Railway connects with both the Norfolk Southern Railway and CSX Transportation. The Raritan Center Business Park is located at the junction of I-95 (The New Jersey Turnpike), I-287, US Route 1 and NJ Route 440. Exit 10 off of I-95 provides direct access to the Park. The Park is only approximately 15 miles from the Port of New York & New Jersey and Newark Liberty International Airport, 25 miles from New York City and 70 miles from Philadelphia.